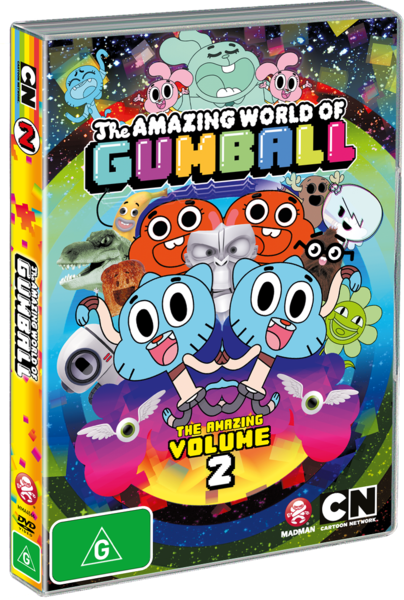 "The Amazing World of Gumball: The Amazing Volume Two" brings you six more amazing episodes and amazingly crams them onto one amazing DVD... Amazing! 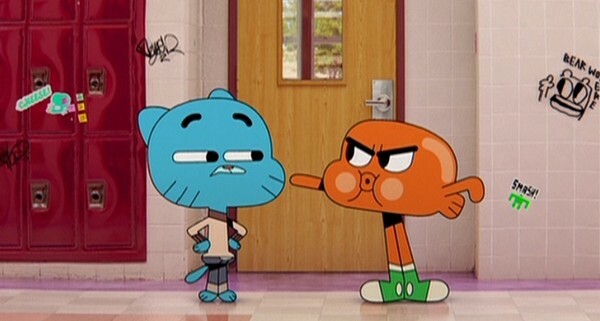 Cheap car salesman jokes aside The Amazing World of Gumball (or Gumball for short) is an animated series about the daily life of a little blue cat named Gumball Watterson. He just loves to play and get into trouble with his adopted brother that used to be their pet fish named Darwin. It is not as simple as that as they live in a cartoon world full of many different cartoon styles including: "Disney" looking characters, "Looney Tunes" styled characters, they even have 3D CGI and "Muppet" styled characters. Some of the amazing adventures found on this DVD includes: Darwin and Gumball invited to a crazy party, Darwin and Gumball getting lost in a dangerous forest while on their way to a picnic, Gumball starting up a race with the town's most dumbest people, Gumball going to a friend's funeral... a funeral for their pet that is, and Gumball and Darwin helping making their dad's wishes come true when he finds a magic wand. It truly is an amazing world. (Click "Read More" to read the full review). Just like a lot of cartoons this series is episodic with a completely new adventure each episode. 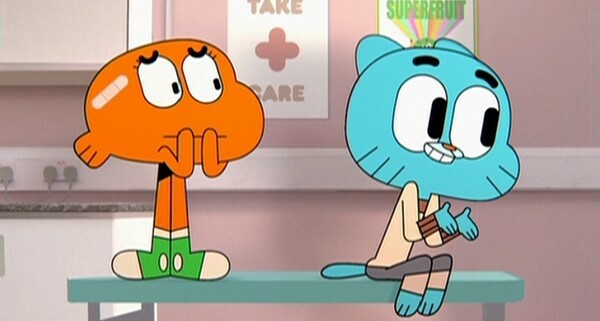 It is done well and you'll find yourself to be entertained with every episode and I really loved the fusion of the many different types of cartoon characters all in this one world. Even though this DVD advertises that it has six episodes you are really getting twelve episodes as each twenty minute show is made up of two ten minute episodes. Even though this show is geared towards younger viewers the adult viewership will get just as big of a kick (if not bigger) out of this show due to how the humor will appeal to everyone. I myself personally found most of the gags to be really funny but there were some real childish ones that I was too old to enjoy. The benefit of having this show on DVD is that there are a lot of background gags that require you to pause the show and those gags were interesting. I did notice some neat little Easter eggs in the backgrounds too like when Darwin and Gumball were at the video game store you will notice that there are real video games in the background including: "Jak III (2004)" and "Eye-Toy Play III (2005)". The characters in this show were all charming and nicely done. I especially loved the interaction between the character as it helped the story and made for some very entertaining situations. If I had to compare then the characters in this show to other cartoon characters then these characters remind me of the very early episodes of "The Simpsons (1989 - Ongoing)" (that's weird for me to say as I remember when those episodes were new) but a lot more cartoony. All the episodes are uncut too and you do get to see everything that they cut out of the television version. A problem that I have with this volume is the exact same problem I had with the prior volume (review to that can be found here) is that this is just a best of DVD and I would've really liked this show to be released in complete season sets but I am also grateful that we get a DVD release of this show... Even though if it's only a best of DVD. Artwork in this show uses many different styles but mainly 2D animation and 3D animation. Characters in this show look very good with some nice but basic designs that are very original. I do quite like how each character is very different looking and it adds a layer of uniqueness and charm. Backgrounds in this show use a mixture of cartoon and photography and they look quite good and really help set the mood to each scene. I find it quite charming how nearly all of the every day objects is living as it helps make this cartoon feel even more cartoonier in a classic Disney sense. Animation in this show can look good during most of the show but there are times where this show looks like it was cheaply animated with Flash Animation. The voice acting in this show isn't bad at all with voices that work really well with all of the characters and it is also quite charming and memorable. The soundtrack in this show also help set the mood to the show and blends in perfectly with the scenes with a mixture of crazy and serious sounds. 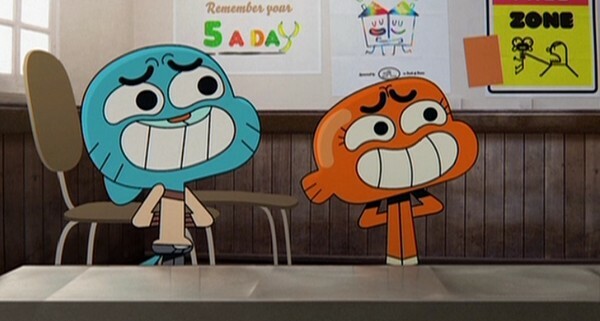 Overall this is a pretty good cartoon series that is full of laughs and charming characters. I do recommend this DVD as it was full of some very good episodes but I do wish that we'd got full season sets but for now this will do. Good viewing.